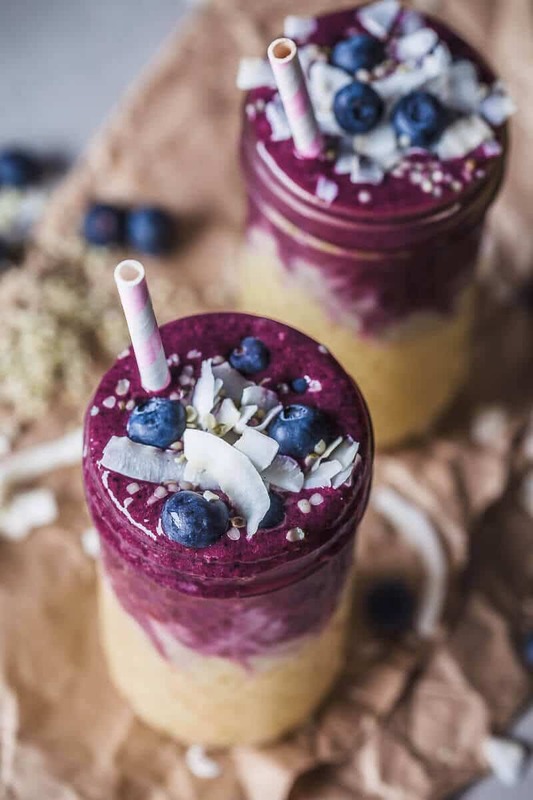 This lovely Mango Blueberry Smoothie uses frozen mango and blueberries and is perfect to maximize your nutrient intake in winter. Use dairy-free yogurt to make it vegan! It is still the middle of winter. 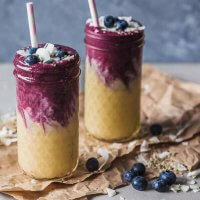 As in-season produce is currently rather low, we decided to mix up our game with this lovely vegan Mango Blueberry Smoothie, that uses – wait for it – frozen fruit! Frozen fruit is great. It is picked and quickly frozen at the pick of its time, so it is ripe and full of nutrients. Freezing is also the best way of preserving produce when done correctly, as it needs no added sugars to preserve and the nutrients loss is rather low. Using frozen produce is a really smart way to consume more vitamins and nutrients in the dead of winter when fresh produce is scarce and the snowy landscape keeps your spirits low. Even such a small thing, like a smoothie of vibrant colors, can help you get over the winter blues! 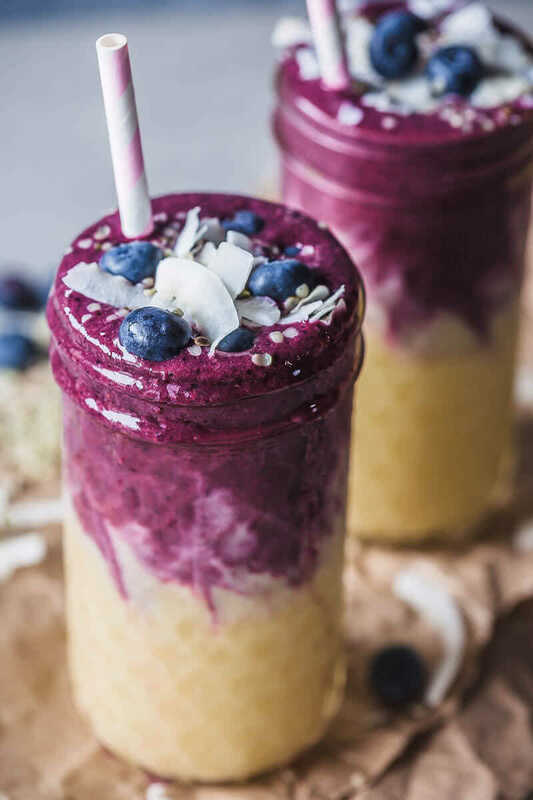 To make this Mango Blueberry Smoothie we used frozen mango chunks and frozen forest blueberries, added some banana and plant-based yogurt and blended well. You can blend everything in one go, or separately the light and dark mixture for a dramatic effect! Top your smoothie with some coconut flakes, hemp seeds, and a handful blueberries, either fresh or frozen! 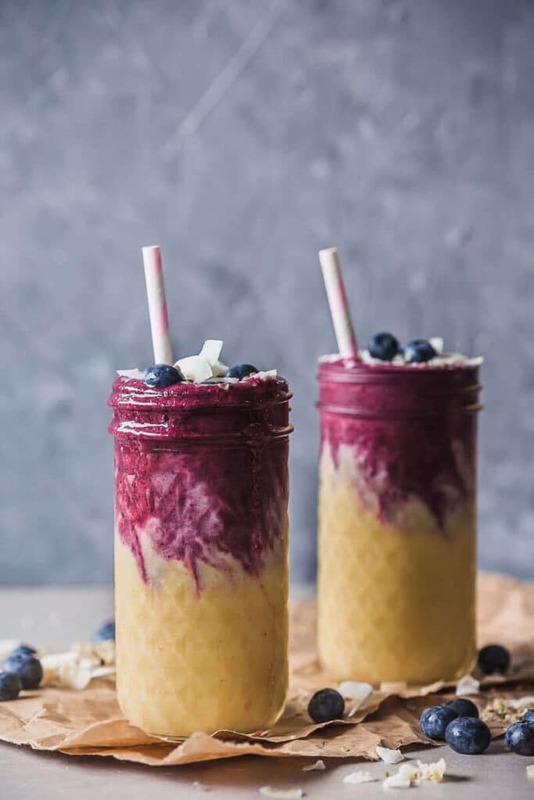 This lovely Mango Blueberry Smoothie uses frozen mango and blueberries and is perfect to maximize your nutrient intake in winter. In a blender add a splash of water and half of plant-based yogurt, one small banana and frozen mango chunks. Blend and pour into a tall glass. To your blender cup, add in another splash of water, the rest of the yogurt, a banana and frozen blueberries. Blend and pour in the glass on top of the mango mixture. Serve with coconut shreds, hemp seeds and blueberries. NOTE: This is an updated post from 2016. We reshot and substituted the photography, changed the recipe slightly and did some SEO to the article. yummm! I love using mango in smoothies. Same here, you can’t beat a good mango in a smoothie. The texture it adds is just phenomenal! This recipe looks so mouthwatering and a perfect source of energy and protein to start a day with.